Wicked Wonderful Words: Review: "The Folk Keeper"
Sometimes a book that is not written for us, as in not written for our age group, gender etc. etc., can be just the right book for us. 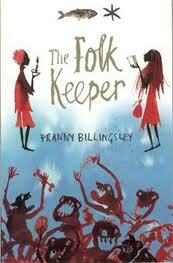 I came across one such book just the other day: the children's book "The Folk Keeper" by Franny Billingsley. This is a fantasy/fairy tale/adventure children's book, a short but sweet and touching tale of Corinna who keeps her gender a secret as she works as a folk keeper in the orphanage where she lives. A folk keeper as in indispensable part of a large household as he is the one who keeps the folk, a mythic people living in the ground who will spoil the harvest and kill the animals if they are not kept happy and content. It is a dangerous job but one that Corinna values - it is her identity. So when she is offered a different life as a folk keeper in a larger household, an estate, she goes there to seek her fortune. What she doesn't know is that she will find more than her fortune, she will find her destiny. This one is an easy one to review because it is a really sweet children's book. It had me captivated even though I should probably have read it when I was ten or twelve, not 26, and it captured my imagination and took me on a trip to Corinna's world. A really good book for teenagers with great imaginations and a love of fantasy. Read it if: You had a dungeons and dragons phase in your teen years or if you just enjoy good fantasy fairytales.